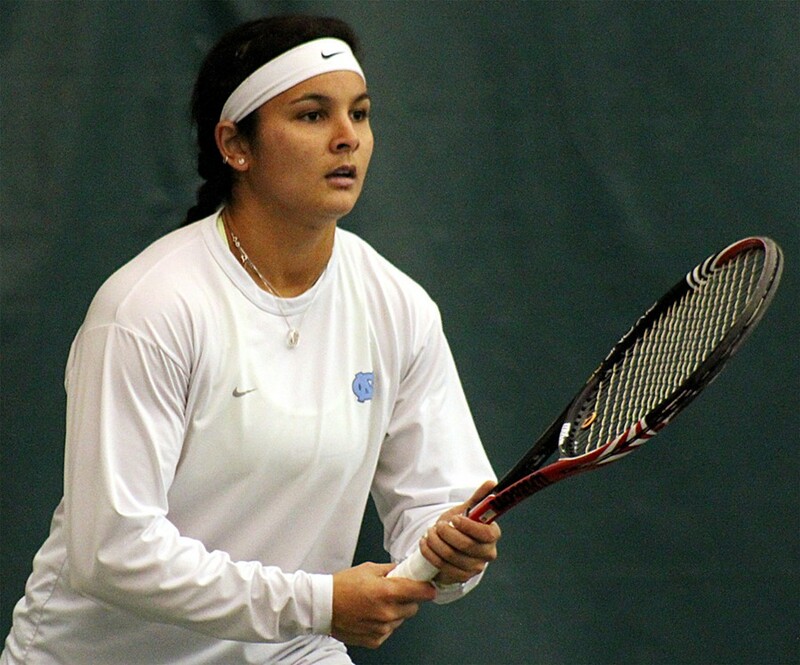 Since joining the North Carolina Tar Heels in 2009, Gina Suarez-Malaguti has been an integral part of the team, which recently won its first national team championship at the ITA Women's Indoor. The 21-year-old senior from Pembroke Pines, Fla., began her college career in the lower reaches of the Tar Heels' lineup, but has moved all the way up to the No. 1 position this year, and is No. 4 in the Intercollegiate Tennis Association's national rankings. Suarez-Malaguti, called "Pichi" by her friends and teammates, credits her fitness and nutrition regime with boosting her results this academic year. "I hung around Chapel Hill longer than usual, working out with our strength and conditioning coach and eating healthier," says Suarez-Malaguti, who was born in Venezuela. "I was just doing the right things, and thank goodness it's paying off now." North Carolina defeated No. 1 seed and defending champion UCLA in the ITA Women's Team Indoor final, with Suarez-Malaguti's 6-3, 6-4 win over sixth-ranked Bruin sophomore Robin Anderson one of the keys to the dramatic 4-3 victory. "It's funny, it doesn't actually feel like I'm playing 1," Suarez-Malaguti says of her position in the Tar Heel lineup, which features three seniors. "It feels the same way as when I was playing 5. As long as I can help the team out, I'll do whatever." That attitude has helped propel the Tar Heels to the No. 1 spot in the ITA Team rankings, with their sights now set on an ACC conference championship and the NCAA team championship this spring. 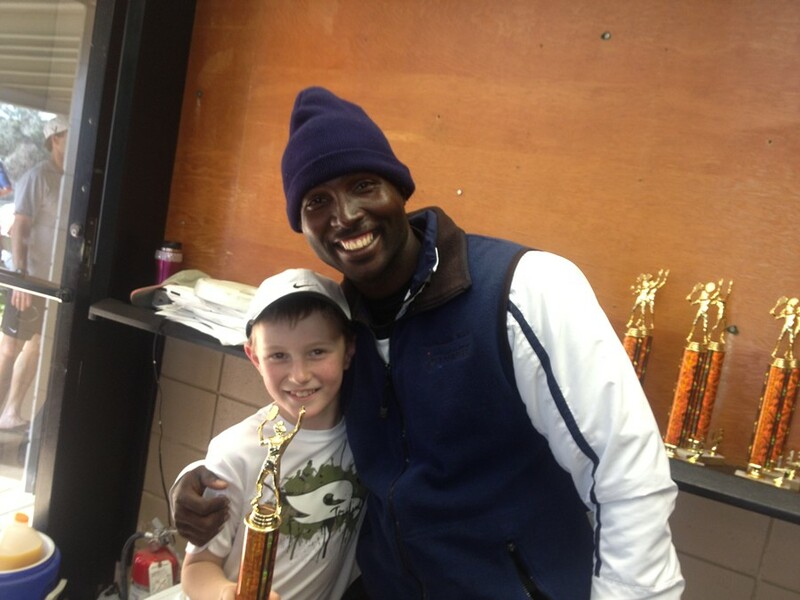 The City of Tallahassee Parks and Recreation Department and the Tallahassee Tennis Association hosted the first Tallahassee Super Series Tournament at Tom Brown Park in late January for junior players throughout Florida. Over 30 players from Tallahassee participated in a sanctioned Level 6 tournament event for boys and girls in the 12-18 age divisions. This type of tournament is open to all players who qualify by ranking. The Top 32 players entered are selected by the latest published USTA Florida Standings List. A 10 and Under Tennis event was also included in the tournament, utilizing specialized equipment, shorter court dimensions, and modified scoring (4-game sets with a 7-point tiebreaker in the third). The format for singles play included two regular tiebreak sets with a third set super tiebreak, if necessary, and single elimination. Doubles play included pro-sets. All players who participated in the event, except for the 10 and Under Division, were eligible to receive ranking points. Boys 18S - Phalguna Rupanagudi (W), Riley Dennis (F); Boys 16S - Austin Racine (W), Brian Wilson (F); Boys 16D - Karthik Krishna Murthy/Allen Vinson (W), Dezmon Fortenberry /Austin Racine (F); Girls 16S - Paige Nicholson (F); Girls 16D -- Lauren Dupuis/Paige Nicholson (W), Elizabeth Bothwell/Goetha Velusamy (F). Boys 14S - Joshua Macri (W), Wyatt Coleman (F); Boys 14D - Achyuta Iyengar /Joey Kelley (W), Joshua Mari/Matthew Wilson (F); Girls 14S - Emma Dobbins (W); Girls 14D -- Grace Wilson/Emmy Dobbins (W), Laura Ceci/Estella Waczewski (F). Boys 12D - Sariam Nalla (W) Girls 12S- Grace Wilson (W), Laura Ceci (F); Boys 10S -- Gleb Kroton (W), Zachary Zengel (F); Boys 10D -- Gleb Kroton/Titus Etters (W); Lance Dupuis/Zachary Zengel (F). Boys 10 Consolation - Addison Hultquist (W). The next Super Series tournament in Tallahassee will be held June 3. For more information, contact Lenin Moncherie, tournament director, at (850) 528-4281, or via email at tournamentlenin@gmail.com. 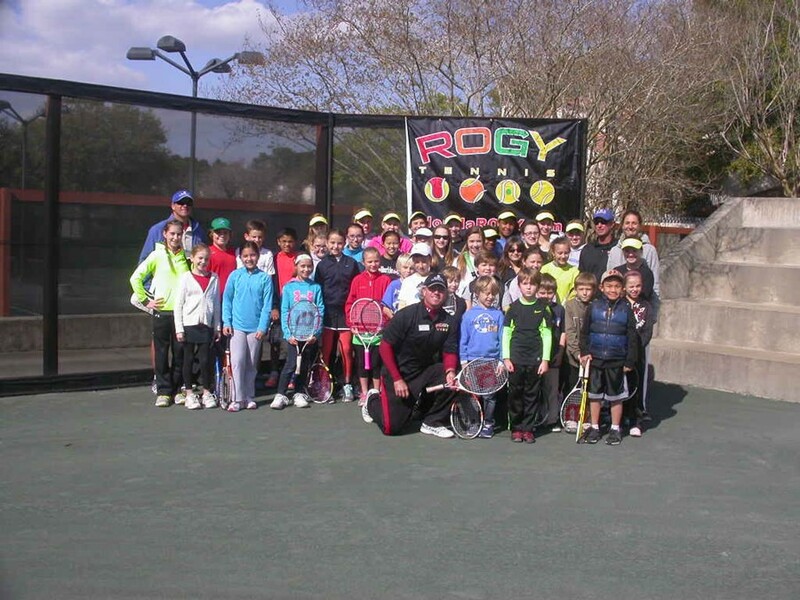 The first-ever ROGY "Tourn-event" was held on March 2 at Tops'l Beach and Racquet Resort near Destin. ROGY is an acronym for the color balls that are now officially part of the 10 and Under Tennis format of play: Red, Orange, Green and Yellow. USTA Florida has launched a brand new series of events for youth tennis players to hone their skills in a fun, no-pressure format. These three-hour ROGY events feature fun match play for kids age 8-16, without the pressure of rankings. The format of a ROGY is a non-elimination play to allow maximum participation. Although entry to the Tops'l ROGY event was done online at a normal USTA tourney website, this was a non-sanctioned USTA event. Tops'l Director of Tennis Joe D'Aleo, his wife, Jessica, along with Tops'l tennis professional Sam Vickroy and Michael Edge, director of junior tennis at Roger Scott Tennis Center in Pensacola, welcomed more than 30 young players to this first-ever event. Edge brought along his Pensacola Washington High School girls' tennis team to help with court monitoring. After the ROGY event, the Washington girls played the Ft. Walton Beach Choctawhatchee High School girls team in a dual match. Players and parents enjoyed music, hot chocolate and cookies in addition to the tennis. In a pre-event meeting with all the parents, handouts describing the ROGY philosophy and the day's events and formats were provided to the parents. D'Aleo and the staff gave out t-shirts, and all the participants got medals. Awards were presented for "fastest feet," "fair play" and "sportsmanship." One of the highlights of the 3-hour round robin event was a point in the continuous music mix when the popular South Korean hit "Gangham Style" started playing. Many of the players dropped their rackets and joined their parents in doing the dance! Jessica D'Aleo ran the 8-and-under players on the 36-foot courts using the red ball. Edge ran the 10-and-under kids on the 60-foot courts with the orange balls, while Sam supervised play on the regular-sized courts using the green-dot balls. After 25 minutes of play, a whistle was blown and players moved either "up the river" or "down the river" depending on who was ahead at the whistle. Even though the weather was a little chilly and windy, the players had a ball. Afterward, the players got a taste of good high school tennis when Washington downed Choctaw. 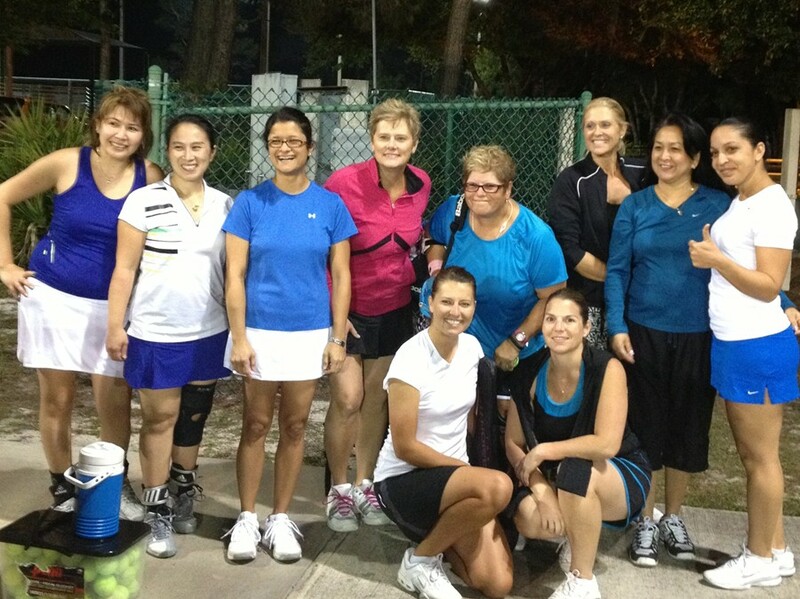 The first two adult USTA Florida-sanctioned tourneys were held in February in Region 1 and weather played an important in both. At the Second Annual Pensacola Adult Clay Court Championships, it was the cold and wind that had players complaining on Saturday. Sunday was sunny with less wind but a bit uncomfortable for the spectators. Tournament director Bruce Caton's provision of plenty of free coffee and hot chocolate was probably more important than the food and beverages! Neither cool temperatures nor 15 m.p.h.-plus winds could thwart the success of last month's 11th Annual Tournament of Champions that named the 2012 charity doubles champions in the Tampa Bay area. 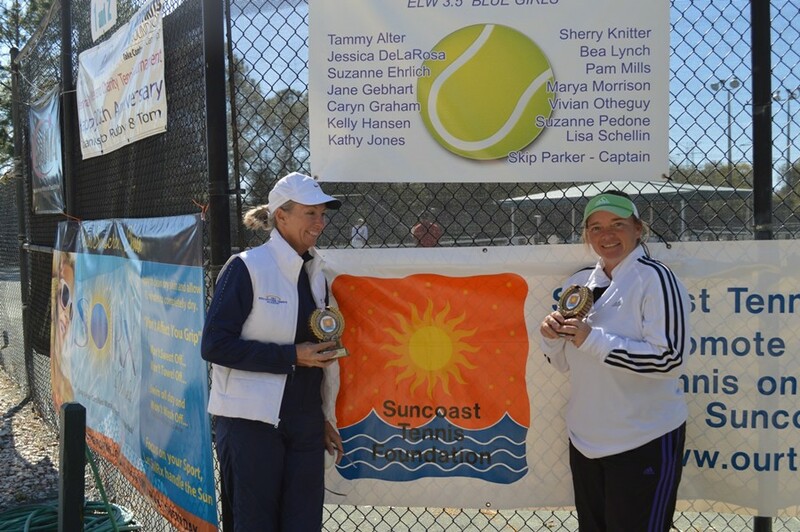 Sponsored by the Suncoast Tennis Foundation and staged at East Lake Woodlands Country Club in Oldsmar, the three-day contest included more than 150 players on 23 women's teams among four NTRP levels, and 31 players in four men's and 26 mixed teams in three NTRP levels. Entry was by invitation only, depending on results in any of the designated 10 charity tournaments held in 2012 in both Pinellas and Hillsborough counties. Winners, finalists, semifinalists and consolation winners from each qualified for the STF Tournament of Champions. Not only did the tournament name the 2012 charity doubles champions, the competition is the sole fundraiser for the Suncoast Tennis Foundation, a non-profit USTA Florida community tennis association. About $13,000 was raised during the tournament, with the majority returned to communities through support of programs and facilities in their efforts to grow tennis. "This tournament is not only a tournament but provides recognition of players that have succeeded at their level in charity tennis competition," said Chris Wyman, president of the Suncoast Tennis Foundation. "It's a great opportunity to get together and celebrate successes." Among the defending doubles champions were Judi Alford and Karen Olson in women's 4.5, Charlotte Tao and Jill DeLucia 4.0, and Brandon Muth and David Robbins men's open. Other champions were Suzanne Ehrlich and Dori Hazama in the 3.5 division and Lynda Parker and Christine Milligan in the 3.0 in the women's field. Sean Vickery and Jonathan Colozzo won the men's 4.0, and Rex Varn and Tom Crociata the 3.5. Mixed champions were Jane Robinson and Mike Erbe in 4.5, Jill DeLucia and Larry Guiffre in the 4.0, and Jessica and Rex Varn in the 3.5. To learn more about the STF, its mission and accomplishments, go to www.ourtennis.net. Standing left to right: Rianne Sanchez, Kim Han, Queenie Crisostomo, Kim Domsic, Denise Wollis, Diane Wichner, Yillah Candelario and Melanie Fiestan. Kneeling front: Caitlyn Kynast, Amy Beaulieu. The 2.5 Ladies 18 & Older Night division is a new division for the Greater Orlando area. The idea was born when Jim Nguyen played on a men's 3.0 team that came in second place in the nation last year. The team was newly formed and as many great captains do, he created a family from friends/neighbors on the team. These men wanted their wives and girlfriends to have a similar positive experience so Jim contacted local league coordinator (LLC) Susie Rahimitabar to see if a 2.5 ladies team could be formed during hours that the ladies could play. Susie is, in addition to the USTA Florida LLC, a local teaching pro at Lake Cane Tennis Center and she was coaching, through team and private lessons, many new players who fit into this category. Caitlyn Kynast and Kim Han stepped up as team captains for Lake Cane-Kynast, and Ft. Gatlin Scrappers-Han. In February they contested their first match, and co-captain Diane Wichner of the home team of Lake Cane-Kynast provided refreshments, and the stands were filled with cheering fans (applauding good shots from both teams). Ft. Gatlin won the match 3-0 but all lines were competitive, and good sportsmanship was evident in the smiles at the final handshake. After the match the ladies posed for the group picture. Nguyen and Han sent a note to Caitlyn the next day that read, "On behalf of the Women Fort Gatlin Scrappers tennis team, we would like to say thank you for hosting one of the best fun match that we have ever attended." Kynast said, "We have a really fun group of ladies that just love playing the game! Everyone brings a different strength to the team and we work to help each other out wherever we can. We are learning a lot and having a good time. We had a great first match against the Fort Gatlin Scrappers and are excited for this season. This has been a great experience for me, I'm so lucky to have such wonderful ladies to play with." Some of the players have joined other daytime teams -- but being new, they may be on the lower lines, playing less than more experienced players. This extra play will allow them to advance much quicker than they ordinarily would, and their improvement is evident to their teammates. 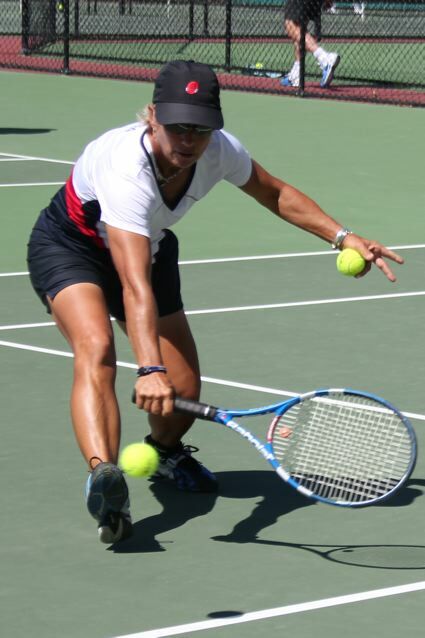 Mary Ginnard, who has 27 USTA trophies, works hard in practice so she can win with ease in tournaments. When it came to choosing the top female tennis player at last year's USTA Florida Annual Meeting and Awards, there was Mary Ginnard, and everyone else. Mary, after all, won the 2012 Gold Slam Doubles (women's 60s) with partner Tina Kawasky of Glendale, California, and won the USTA national tournaments on clay, grass, hard courts, and indoor, as well as the International Tennis Federation (ITF) world championship in Croatia. The teaching pro at Lauderdale Tennis Club, Mary is also a coach at the Harold Solomon Tennis Institute (for those new to the sport, Solomon was the world's fifth ranked player in 1980). Speaking of rankings, Mary is No. 5 in women's 60s singles nationally and, with Tina, No. 1 in women's doubles (60s) nationally and in the world. Champions give back, and Mary is no exception. She's currently preparing two 8-year-olds to qualify for Solomon's wisdom, and coaching other kids in the program on their games -- and their minds -- to enjoy the process of learning as much as the thrill of winning. A tomboy with six brothers, she didn't pick up a racket until she was 18. Four decades later, she still loves learning about the sport that she excels at. In fact, she enjoys that more than winning tourneys. "Even Roger Federer works at trying to improve his game," she said with a smile. "Oh, sure, when I won my first Gold Ball, I could have walked on air for two hours." Now, she prefers spending two to three hours on a Saturday improving her footwork, hitting her wicked forehand even harder, perfecting her different serves, and learning various game strategies. According to Mary, hard work pays off in tennis and life. "Becoming a better tennis player is about problem solving," she says. "It's about seeing what you can do on the court that day to prevail, sometimes in the heat of battle, even when what you're doing isn't working." This flexibility of thinking, she concludes, makes you not only a better tennis player, but a more successful human being in every area of your life. And success is something that Mary Ginnard boasts in abundance.